Arun Tiwari, journalist and poet, has written extensively on rural development, ecological democracy and water related issues in India. and social justice often employ poems to bring attention to an issue or campaign. A poem has the power to seize a moment, sentiment and response. This quarter I read two poems written in Hindi, both examples of lament poetry for the mighty Ganga River, which we have attempted to render in English; undeniably much has been lost in translation. 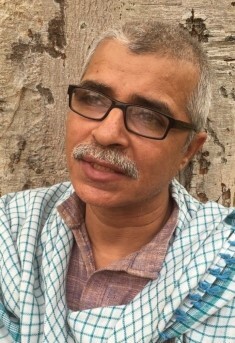 Arun Tiwari, a journalist, wrote the first poem featured here while covering the Kumbh Mela in 2008, a cyclic Hindu festival held at four designated riverbanks. This particular event was held at Haridwar on the banks of the Ganga, and the poet questions the depraved thinking that has led to the ruination of the river. Is this the new dawn of our dreams? Do we remember our relationship with the river? Have we forgotten the awakening of thoughts at the Kumbh? Have we forgotten how we tolerated Faith of all hues? After all doesn’t she sustain us all? Shame! What sort of progeny are we? Forget ritual, where are her custodians and caretakers now? Whom should she cry and complain to? But did we try to limit the mountains of concrete that inhibit her? Did we try and save what was left? क्या श्रीकृष्ण वाक्य हम भूल गये ? ऐ नये भारत के दिन बता…. हा! कैसी हैं हम संताने !! ऐ नये भारत के दिन बता…..
क्या बात सदा यह याद रही ?? Vimal Bhai, activist and poet, penned his thoughts as witness to the filling of the Tehri dam reservoir. 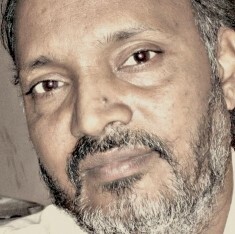 Vimal Bhai, an anti-dam activist, has written the second poem featured on this page. In 2001, at a time when civil society was still waging the anti-Tehri dam struggle, in a spontaneous expression of sadness he wrote this poem on the banks of the Bhagirathi River adjacent to where tunnels had been laid to divert water in order to build the 260 metre high dam. He wrote the poem as the tunnels were being sealed in order to allow the reservoir to fill. O Ganga, I seek forgiveness! For I come when you’ve already been silenced like a pond! when you were a lively gushing River. by beautiful mountain streams… teeming with aquatic life. at a wall of concrete. for I came too late. the women of Tehri no longer worship you. you’re no longer deemed worthy of the adoration. I could not stop this. is today a wretched picture. my thoughts are disrupted by your loud cry. to acknowledge my bleak future? मृतप्रायः भविष्य को देखने ?